This is a process of matching balances in the account records in correspondence to the information on a bank statement. The aim is to clear the differences between the two parties. This means that the bank reconciliation requires the amount in company’s records. 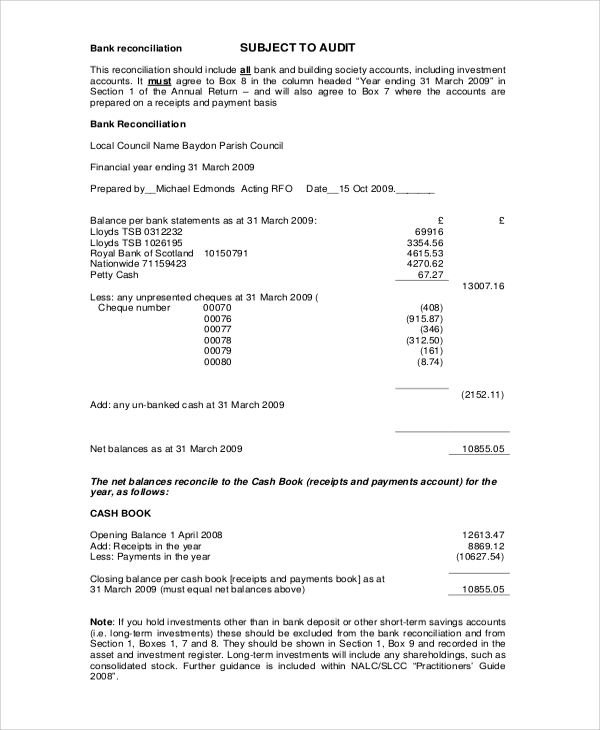 A typical example of the Sample Statement is the bank service charge for maintaining the account and cheque printing fees. Performing bank reconciliation is necessary for the precise accuracy of the accounting records. 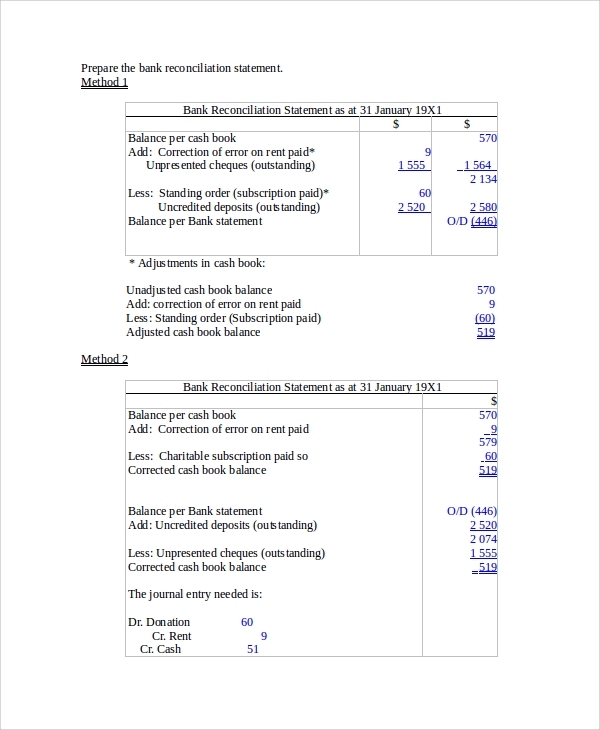 The cash balance of the company at the bank does not often match to the account records. The two types of bank transaction are deposits in transits and cheques outstanding. 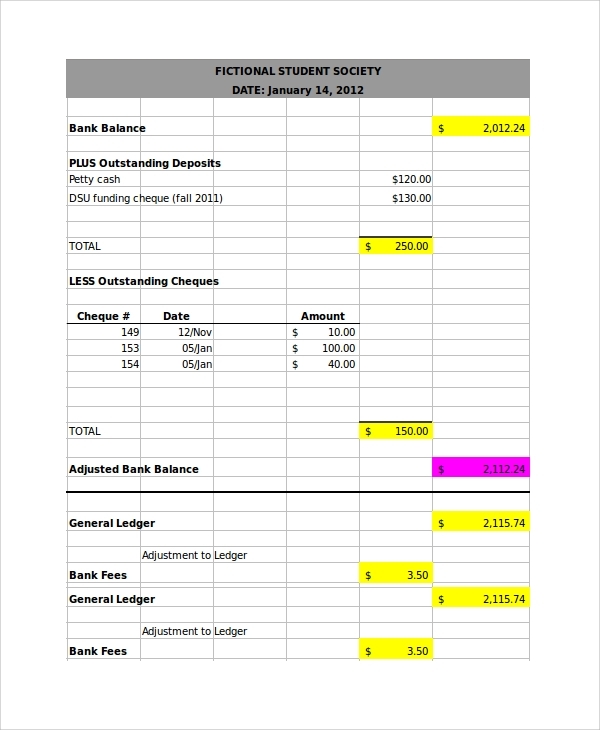 The adjustments in this type include the service charge of the bank which helps to main the account, charges for returned cheques, printing charges and percentage of earned interest. 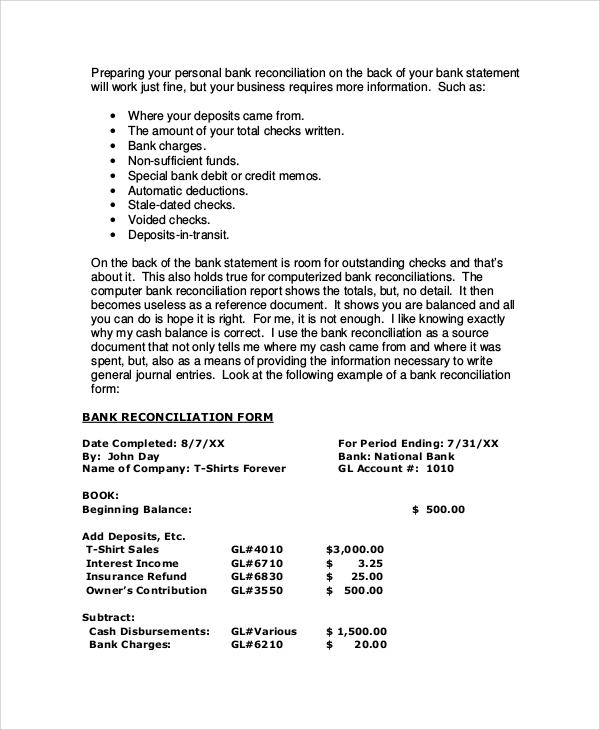 The Bank Reconciliation Form consists the list of items which adjusts the Bank Statement balance change to cash balance. It keeps the history along with the dates and other details. When one uses the Bank Reconciliation process, it helps him to spot any cheating or forgery in the case of transactions. It also helps one to detect any error in the accounting process through the bank reconciliation process. This includes all the errors in the list, lost cheques and missed payments. This process also reveals the information whether the another party has cashed the previously sent check or not by this process. 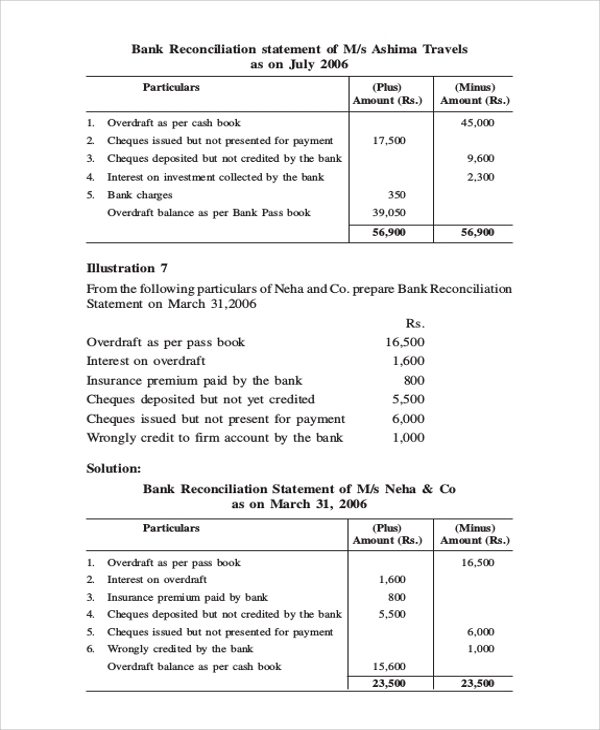 So opting for a bank reconciliation process out of the others, might save you from any mistake which could affect your bank credit in a negative way. In this process, the bank receives all the public money provided for accounting purposes of the entity’s Cash Receipts and deposits. This process requires periodic departmental reports of money receipts. 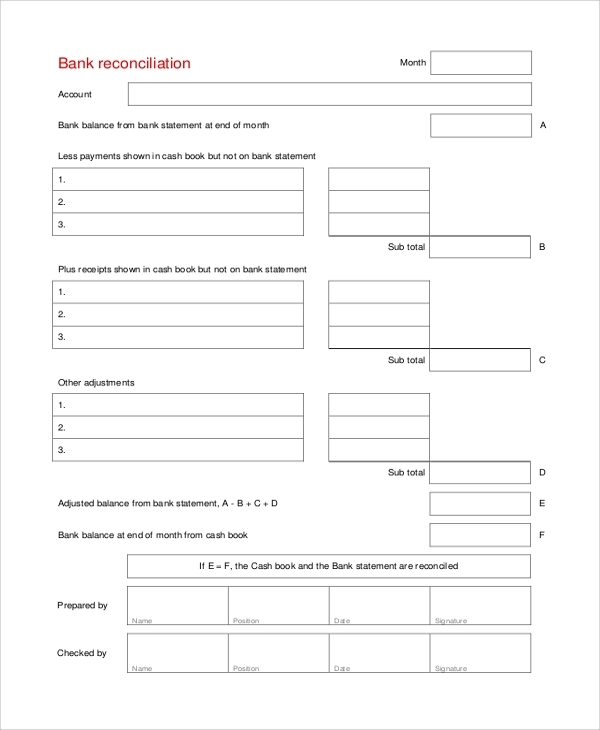 One needs to download the bank reconciliation template and incorporate it into one’s process in the ending of the month. This acts as a check between the records of both. Bank Reconciliation process aims towards the mass population who are engaged with the banking process of transactions and deposits on a daily basis. This is mainly important for the people who transact a lot of money or owns a company or business which require massive amount transfers. It helps one to compare the account records – paid and received and matching them up with the transaction statements. One just needs to provide all the required details, and it is done. The methods do not include any such complexities which can make the people fall in distress with their money. 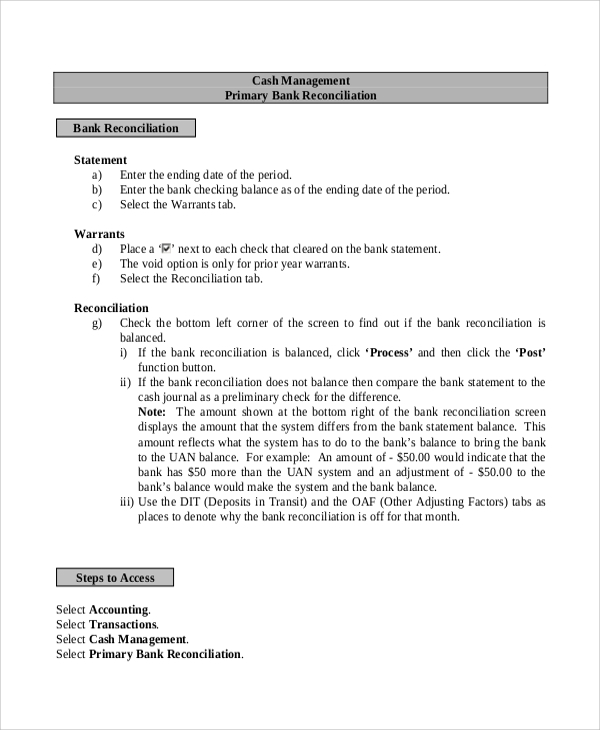 The bank reconciliation demands all the valid Bank Statements along with the details of the holder’s account. Provided all the details, the bank ensures a safe, secure and an easy method of carrying on with the procedures and ensures the customers an experience which does not involve any such complexities.